Mitt Romney is going to cut everyone's taxes and it won't add a single dollar to the deficit. He didn't say how he was going to do it. 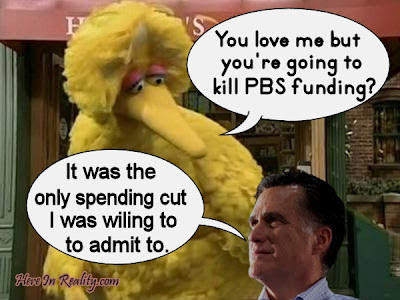 The only specific I heard was that, as much as he loves Big Bird, he's going to cut off PBS funding. It was the only specific I heard in the the whole speech. 1. You only have two minutes. There is no time for stories about your grandmother, no time to share tales about people you've met, complete with their names and the names of their cities and states. Your two minutes have one purpose and one purpose only: To call out Mitt Romney on the companies he's destroyed, on the jobs he shipped overseas, on his money in the Cayman Islands and Switzerland, the lies he's told during the campaign, on his failed record as the Governor of Massachusetts. Two minutes is not enough time, so leave out the "stories" unless they pertain to Mitt Romney! 2. Dumb it down! As intelligent and analytic as your well-thought out responses are, you're speaking Greek to the "undecided voter," the one not informed enough to have made up their minds about this. The reason they're not informed is because brains are not their strong suit, otherwise they would have already made a choice long ago. Don't say, "Romney won't increase revenue." Say, "Romney refuses to raise taxes on the richest Americans!" Keep your speaking at an eighth grade level! 3. We know what you've accomplished. Very quick specifics are fine, but the time you're allotted to speak needs to be devoted to Governor Romney's record, not your own! Now, somebody please pass this along to the President's debate coaches, and quickly! I really, REALLY hope he is pulling the savvy pool shark/poker hustler trick of intentionally throwing the first game to draw in the sucker and up the stakes. Leigh Ann. May I say, for the record, and once again . . . You are an EXCEPTIONALLY BRILLIANT woman.